In 1902 R. H. Macy & Co. made a surprising, and somewhat shocking move. The department store on 14th Street was the anchor to the Sixth Avenue shopping district known today as The Ladies’ Mile. Stretching to 23rd Street, the area was home to massive commercial palaces, many a full block wide. 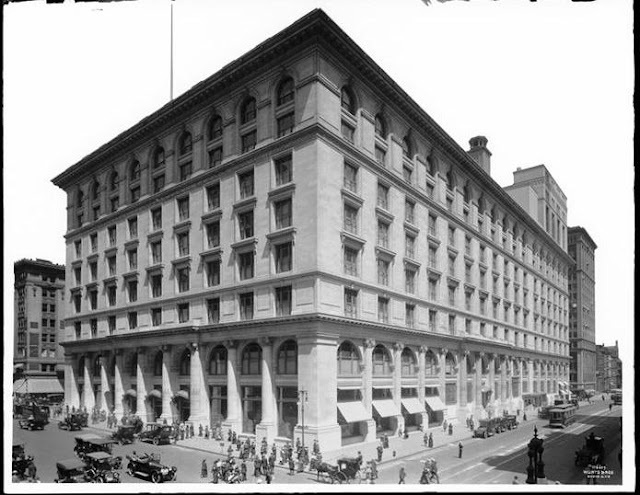 But that year Macy's abandoned the Ladies’ Mile and moved twenty blocks north, to Herald Square. It was a bold move that signaled the eventual end of The Ladies’ Mile. Benjamin Altman’s department store which engulfed the block from 18th to 19th Street was among the most prominent. But two years after Macy’s move, it became apparent that Altman had quietly been amassing property for a new site, as well. Altman’s choice of location was even more shocking than Macy’s had been—squarely on elegant Fifth Avenue and diagonally across from the exclusive Waldorf-Astoria Hotel. Unlike many retailing moguls, Benjamin Altman—who had left school at the age of 12 to work in his father’s store—was unusually sensitive to the conditions of his employees. Perhaps remembering his own childhood, he established a free school in the building for the staff. And he installed an employee cafeteria with affordable prices which the company subsidized. The resulting $1 million Italian Renaissance addition would rise 12 stories and meld seamlessly with the original structure. Much of the upper floor space was dedicated to employee areas. The entire 12th floor was given up to the “employes’ home.” It would include “airy lunchrooms, a cafeteria, and kitchens equipped with the most modern manner,” according to The New York Times. There was also a medical suite with a consulting physician, a surgical room, and two hospital wards containing seven beds. “A physician and two nurses were engaged at the expense of the firm, to be in attendance in the medical suite,” informed the newspaper. 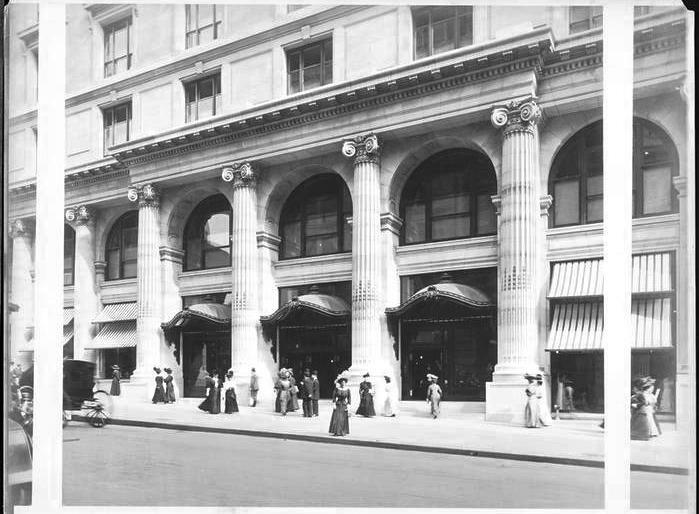 The Madison Avenue addition was completed in October 1914, doubling the size of the store. Customers’ comfort was augmented by “providing on the fifth floor a writing room for women, furnished in blue velvet, with a carpet of the same rich tone. Within each reach an information bureau, telephone booths, and the general store offices were arranged,” reported The New York Times on October 4. The bachelor retailer would not live to see his addition completed. On Tuesday October 7, 1913 he died in his mansion at No. 626 Fifth Avenue at the age of 72. Shortly after 3:00 that afternoon a messenger arrived at the store with the news. Managers moved from counter to counter, quietly informing the clerks and directing them to stop making sales. Customers were ushered out of the store and the doors were locked behind them. Benjamin Altman’s funeral was held in the Temple Emanu-El on Friday morning. The store remained closed through the following day. Altman’s will left no employee out. He bequeathed $10,000 each to his two secretaries—more than a quarter million dollars today—and various amounts to employees who had been with the store for 20, 18 and 15 years. Those associates received checks for $2,500, $1,500, and $1,000. Newer associates were included, as well. The will “provides for compensation for everybody not included in the above-named classes,” said Cadwalader. The checks totaled more than $1 million. The same year that the Madison Avenue extension opened, B. Altman’s took a dramatic step in defending its carriage trade clientele against competition. For the first time ever, a major Paris dressmaker showed her line in New York. Jeanne Paquin’s entire new spring line was paraded before the press, retailers and dress manufacturers in the Ritz-Carlton on March 4. A bizarre and tragic accident occurred a few months later. On the morning of August 15, 1914 Mrs. William Hinman left her Brooklyn home to meet her mother, 85-year old Hannah Van Dusen, for a day out together. The two women enjoyed a ride along Riverside Drive for the views and fresh air, then boarded a bus to Washington Square. Officials went through a reenactment and made measurements. It was determined that “any one of the knobs, hanging down about eighteen inches apart around the edge of the canopy would strike the railing on the top of the motorbus.” The law provided for a clearance of 13 feet. The decorative canopy did not last much longer. The unfinished arch above the 35th Street entrance is all that remains of the canopy that resulted in Hannah Van Dusen's death. Note the Art Nouveau influences in the design of the entrance. The high class of the store’s clientele was evidenced by the items it offered. On October 17, 1915 the New-York Tribune made note of one especially attractive accessory. “A deep note of splendor is struck by the exquisitely colored ostrich fan, which is uncurled, but droopingly curved at the long ends. Shades that are not often seen are found in these fans. They cost $40.” The cost of the item, included in what the newspaper deemed “Feminine Frailties,” would equate to about $975 today. In 1888 Altman’s had hired 14-year Richard Jackson as a “cash boy.” He took advantage of the Altman School to learn business principals and he read books in the New York Public Library’s branch in the store. He was successively promoted, first to a messenger, and by 1905, was moved into the advertising department. “Christmas gifts in cash amounting to about $400,000 were distributed yesterday among all the 4,000 regular employes of B. Altman & Co. by the Altman Foundation,” reported the newspaper. “The remembrances came as a complete surprise to the workers in the great mercantile establishment.” The average envelope contained $100. The B. Altman & Co. interior decorating and furnishing department was handsomely arranged in room settings. 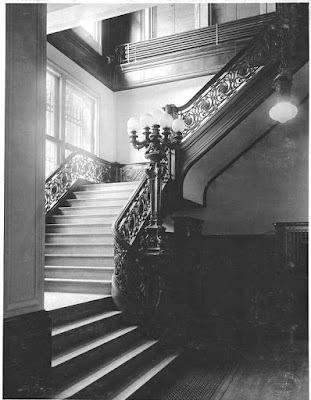 In 1923 the department received a great honor when it was selected to redecorate and refurnish the Governor’s Mansion in Albany. The $75,000 project would perhaps be handled differently today; but in the 1920s more emphasis was put on modernization than preservation. Much of the antique furniture was removed and donated to the Brooklyn State Hospital. The Times noted “Some of the furniture that was taken away was old when Roswell P. Flower lived at the Executive Mansion. There had been very little new furniture bought since that time.” Flower was Governor from 1892 to 1894. Throughout the decades B. Altman & Co. vied with the other grand emporiums of Fifth Avenue—Lord & Taylor, Saks, and the nearby Macy’s, for instance—in one of Manhattan’s most beloved traditions. The Christmas windows attracted thousands of visitors every year and red velvet ropes were required to organize the lines of starry-eyed children and grown-ups alike. The Times admitted that “The grand emporium is a vanishing species.” The 880,000 square foot structure had been purchased by KMO-361 Realty which proposed using 650,000 square feet for the New York Resource Center and the remaining space for the New York Public Library’s Science, Industry and Business Library. Architects Hardy Holzman Pfeiffer Associates and Emery Roth & Sons oversaw the conversion. Today, despite several regrettable losses such as the first floor column capitals and the fourth and fifth story lintels, the limestone palazzo looks much as it did in 1906 when well-heeled ladies alit from their carriages. The beautiful mahogany paneled Fifth Avenue foyer survives intact. On a side, note, Benjamin Altman’s altruistic fund did not fade away with the department store. When the store closed, the Foundation had given away more than $235 million. It continues today quietly donating money to various worthy causes. In 2004, for instance, it gave the Friends of the High Line $145,000 in three grants and added another $25,000 in 2010. "In 1902 dry goods merchant Roland Macy made a surprising, and somewhat shocking move ... to Herald Square." "R.H. Macy died in 1877 and, in 1895, the company ownership passed from his family to Isidor and Nathan Straus, brothers who, with their father, had leased the basement of the store in 1874 and established a famous china department there. The Straus family continued to build on R. H. Macy’s legacy of ‘firsts’ throughout the early years of the 20th century." Other sites, including Macy's main Web site, provide a similar history. Altman's closing resulted from changes in the tax law, which no longer allowed The Altman Foundation a non-profit, to operate a commercial business. The foundation survives to this day. That’s only partially correct. The stores had to be sold off from the foundation which they were in 1985. It was a bad investment corporation that both them and Bonwit Teller and both went into backruptcy in 1989. I was a buyer there at the time. I worked for B Altman’s in NYC as a buyer. Hearts and spirits broke when it was announced the store would close and be no more. I still work in NYC and pass the building often. I always smile to myself remembering all the memories of working there. B Altman’s and Bonwit Teller both closed that year due to bad mismanagement of their new owners.